Named "One of the Top Five Poker Runs in the Nation" by Performance Boats Magazine, the 22nd Annual Desert Storm Poker Run & Shootout is guaranteed to be a world-class collection of the most prestigious performance boats from across the nation! 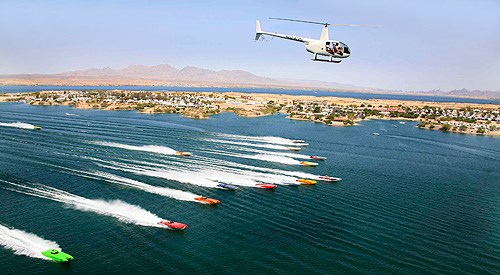 Running from the heart of Lake Havasu (starting at Site Six off of the island) to Spectator Point, top speeds upwards of 175+ MPH are not uncommon here. All performance boaters are invited to participate! The air will be buzzing with the racers' helicopter teams flying above the boats right above the water.